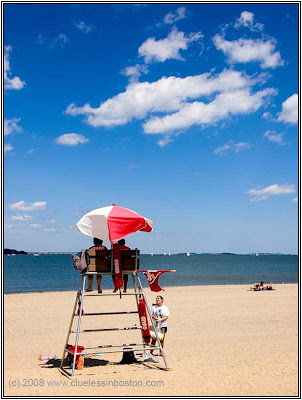 Beautiful sunny day at the beach, but the waters in Boston harbor have been declared unsafe and swimming is not allowed, making it a day at the beach for the lifeguard. All I can say is I wish I were there! Very nice summer shot. Wish I were there with Chris and you all.